"There are Seven Skills in the Way of Jalal," whispered the Elder Paw. "We know only three of them. Their names are these. Slow-Time. Moving Circles. Shadow-Walking." Varjak Paw is a Mesopotamian Blue kitten. He lives high up in an old house on a hill. He's never left home, but then his grandfather tells him about the Way – a secret martial art for cats. Click to start reading the story! Click to see buying options! Hello SF Said, I am Brandon, I am very young though, yet I have read your books of Varjak Paw, and Outlaw of Varjak Paw. I am very (VERY) interested to see a third book, and please may one day it will come. As I thought maybe, ideas could be : "Holly Bones" "Gentleman's return" "Cludge's Betrail" "The Scratch Sisters Return"
Hello Brandon, thank you so much for your kind comment, and your great suggestions! There will definitely be a third book one day; I've written a bit about it here. In the meantime, I hope you'll also try reading my new book Phoenix – I think it's the best one I've written so far! Hello SF Said, I'm Fuchsia and I have already read Varjak Paw and have just started The Outlaw Varjak Paw I would love to know when the third book is coming out, as I really want read it as soon as I can, and if you want to, could you tell me a bit about it,unless you want to keep it all a secret. Hello Fuchsia, thank you so much for your comment! I've written a bit about the third book here - I hope that answers your question. Hi SF Said my name is Scarlett and your coming to Seathorne primary school in Skegness. You will be coming in the classes 5M and 5J were all excited and you know my teacher i think because you emailed him and he emailed back also your coming on the 16th December and were raising money so you can come to seathorne school.your the best aurthor ive ever heard of weve just read the 1 st varjak paw book now were on the 2 nd book there both.also im excited what will happen to varjak when razor finds him also tam and sally bones and the outlaw cat twins. please reply so i can tell my teacher who you know mr mitchell but his real name starts with an n.
Hi Scarlett, and thank you so much for your lovely comment! I am really looking forward to visiting your school. Please say hello to your teacher and everyone at the school for me! I'm so glad to hear you're enjoying the Varjak Paw books; please also look out for my new book, Phoenix - it's just been published! See you soon! Hi SF Said, my name is Brandon and I am ten. Is there any way to read The Outlaw of Varjak Paw without getting the book? Also, I would like to thank you for convincing me to read more novels. Hi Brandon, thanks so much for your comment! I'm really glad that you're reading more novels, it's the best thing you can possibly do! Good luck, let me know how it goes! Hi Velle! And wow, that's a fantastic piece of art! I really like it, and of course I don't mind... would you mind if I posted it here on my blog some time? Hi S.F.Said! I am 11 years old. I really enjoy reading your Varjak Paw books, they are in my top 3 favorite series of books! I read every night, and I have read The Outlaw Varjak Paw, and Varjak Paw many times. I am wondering if there would be a 3rd book in the series. It would be very good and I have a few ideas, like if Varjak becomes a teacher of the way to other cats! Thanks for reading, and keep the way alive! Hi L.W. and thank you for your lovely comment! Yes, I am definitely planning to write a 3rd Varjak Paw book one day, and I'm thinking it will be something like what you're imagining - I wrote a bit about this question here. Thanks so much again! And Keep the Way alive! Thank you so much for your kind comment! I have heard about the Warrior cat series, but I've never read any of them. Would you recommend them? I read Varjak Paw when I was in elementary school still and I absolutely loved it, it's still one of my favorite books of all time! As much as I would LOVE to go to a book signing of yours I am unfortunately living in the USA and traveling that far isn't possible for me right now): Is there any way I can get a signed copy from you? Oh, yes and I have another question (sorry)--do all hardcover copies of Varjak Paw include color ink dreams, or only first edition copies? Hi Tomoe, thank you so much for your kind comment! If you like, I could sign a bookplate for you and send it to you - it's a kind of big label which you can stick in your book? If you'd like that, leave me a comment with your postal address - I won't publish the comment, but I'll send you a signed bookplate! No problem! All the hardcover copies should have the colour dreams (amber in the first book, blue in the second); all the paperbacks should have them in greyscale. HI i'm danusha, i'm from oakridge school, you are coming to our school soon. I have been reading the varjak books for about a month now i love the martial arts!! see you at my school and please reply!!!!! (my teacher is called miss c hawe, she a very big fan of you!) KEEP THE WAY ALIVE!!! Hi Danusha, thank you so much for your fantastic comment! I'm really looking forward to visiting your school this week and meeting you all! hi, it's danusha again! By the way you are coming to our school tomorrow and my teacher is called Miss C Hawes!! See you soon!!! P.S What is the third Varjak book going to be about? Hi its Danusha, you were brilliant! your insperation was fabulous! But i REALLY WANTED TO GET YOUR AUTOGRAPH! i wish i could get it!!!! Hi Danusha, thank you so much, that's really kind of you to say! I'm sorry that I didn't get to sign anything; I thought the school had organised a signing, but it seems that they didn't. Maybe next time! Thanks again for the great welcome - I'll make a blog post about the visit soon. Hi Sf Said! I loved all your books but most of all Varjak Paw.My favourite character was Julius,Holly,Varjak and Sally Bones! How did you make up the cat mesopotamian blue? Hello, I just got The Outlaw Varjak Paw for christmas...I just finished as if today! This has to be animated..So I decided, when I grow up, I want to make an animated version of Varjak Paw! Wow! That's amazing to hear, Brandon - thank you so much! I'm really glad you liked The Outlaw Varjak Paw as well, and I agree that it would make a great animation. So good luck with becoming an animator; I think it would be a fantastic thing to do! Hi Mitchell, thank you very much for your comment! The idea of Mesopotamian Blues was based on real cat breeds like Persian Blues. Persia is the ancient name of modern Iran, and Mesopotamia is the ancient name of modern Iraq, so it seemed logical! I also wanted Varjak to go back to the origin of everything, and that's what Mesopotamia means to me. It's where civilisation began: the oldest stories we know come from there, and the oldest writing, and cities, and agriculture... So that's why I chose Mesopotamia! Thanks again, and keep the Way alive! Hi S . F. Said! In class we are reading Varjak Paw and so far I think it is brilliant. I am at All Saints School in Cockermouth and my teacher has asked us to find out what your initials S.F. stand for. I have looked on the internet for ages and I couldn't find out so I thought the most sensible thing to do was to ask you yourself. Pleeeeeeeeeeease tell me or tell me your reason for keeping it a secret so I can go on the Proud Cloud in class this week. Hi Daisy! Thank you for your lovely comment. It's not a secret - the S stands for Sabah and the F stands for Falah. The reason I use initials is that my name is Arabic, and it's hard to pronounce properly unless you speak Arabic; I thought initials would make it easier for people. Also I think the initials look quite writerly: CS Lewis, JRR Tolkein and JK Rowling all use initials... although I did it before JK! Hi I cant believe that I'm talking to the author of the Varjak Paw books. I am 9 years old and I read Varjak Paw, and Varjak Paw the Outlaw with my dad. I absolutely loved them!!!!!!!!!!!!! I think they are my favorite books ever (an I have read the Harry Potter books). I loved these books sooooo much that I'm doing a book talk on them. The whole of South Hill Elementary school (in Ithaca N.Y.) will be there. Thank you so much for what you gave me in these books. hey S.F Said! I ADORE your books! I espespecialy love varjak paw! We were reading it in school and me and my class LOVED it! every time our teacher would finish a chapter, the class would plead for another chapter. when we finished the book, the next minute the whole class was asking her to buy the second book, but she made us promise not to read it before she started it :( and she never did start it yet :(. I am DYING to read it!!!!!!! Hi Talia! Thank you so much for your lovely comment, it really means a lot to me to hear amazing things like that! Good luck with your book talk, and please say hi to South Hill Elementary School from me. thanks SF Said! and, I would love to read your book Phoenix! That... I just can't explain what an amazing piece of art that is. AMAZING. Thanks for the comment, Kate - I love it too! Sadly i can't finish the book because it will finish on friday and tommorow i am going to india (today is tuesday) please could you send me a copy of varjack paw original so I could find out the ending. Hello Prabhjot, and thank you for your message. I'm glad you're enjoying Varjak Paw! I can't send you a copy of it, but this link will take you to a page where you can see how to get a copy for yourself. If you click the 'buy now' button, it will show you lots of different options. Alternatively, you can borrow a copy from a library - either your school library or your local library should have one. If they don't, you can ask them to order it, and they should do so! Thanks for the link and thanks for reading my message. I feel bad asking an author for a free book. Thanks Prabhjot! Have a great time - and keep the Way alive! I enjoyed your book Varjak Paw. P.S:What does S.F stand for? I only want to give you a huge THANKS. Execuse me if I make some silly language mistakes somewhere, english isn't my native. I've read both Varjak-books six or seven years ago. They were my favorite books at all for an extremly long time - even for years. "Varjak Paw" included everything I needed and loved - fairytales, wisdom, sunny Mesopotamia, blue color, cats, cats, cats, heroes, winter, dreams... Your books and Dave's pictures made a big part of my childhood. No joke. It's only because this plot and thoughts concur me at all. I thought, I don't need Varjak Paw anymore, now, when i'm not a little child. But yesterday I saw this books on the window-sill, and hardly cried about the sunny, like Mesopotamia, clear, like the Way, happy moments of reading it again, and again, and again, moments from my childhood. And then I suddenly realized - I've followed exactly Paws' Way all my life, but didn't knew about it! I don't know, how, but your books gave me inspiration for the really long time. Just thank you, SF Said. Thank you for ideas, for creating this world, thank you for creating Jalal and Varjak - and all the Paws - who gave me the Way. I know you hope I like Phoenix. I promise that I will read and comment it some day, as my gratitude to you. But now i'm too confused for reading another good books by influence upon me that both Varjak-books had. One more thing - when Varjak went up inside the tower (The Outlaw Varjak Paw), the pictures on the walls seemed familiar to him, but the cobweb's didn't let him look at them carefully. Could you tell me this secret - were it the same pictures, that he saw in the Mesopotamian mountain's depths? What is the connection between tower, pictures, Way and Sally Bones? Maybe, Sally Bones had her own histiory, that you know, but there was no need to tell it in the book? Could you give me at least small hints?.. I guess, there's no need to say I hope for the third book. I am - attention! - I am a girl of fifteen. Thank you very much! They're my initials - they stand for Sabah and Falah, which are Arabic names, and difficult to pronounce if you don't speak Arabic. At a certain point in my life, I thought it would be easier for everyone if I just used initials; also, a lot of my favourite writers used initials - CS Lewis, JRR Tolkein, JK Rowling of course - though I did it before she did! Thank you so much for your amazing comment - I love what you've written, it really means a huge amount to me to hear such wonderful things about my books! I think Sally Bones definitely had her own history... but I can't say too much about it yet, as there might be more about it in the third book... I'm not sure yet! Most of what I know about the third book I wrote here. It will happen one day, for sure - but it might not be for a while yet. As for ages - I don't really think about them when I write. I hope that anyone can enjoy my books, however old they are, at any stage of their life - so thank you again for writing me much a lovely comment! Thanks so much for visiting my school St Joseph's ! I'm not trying to be rude but I think the ending to Phoenix is too sad I would've liked it if Lucky came back down to Charon and not turn into a star , sorry. Anyway I'm looking forward to Tyger and I sincerely hope you finish it SOON!!! Your trip to the school was exhilarating and you was hilarious. Hello, SF, my name is Amber. In 'Varjak Paw', in the beginning you said Jalal fought many 'Warrior Cats'. I'm a fan of Erin Hunter's 'Warriors' Series, which is about wildcats in forests who (mostly) reject the life of a house-cat. I think it would be interesting if you did kind of like a duet sort of thing, like write a book about wildcats together. Can that even be done? Nice writing (even though I only read The Outlaw Varjak Paw' and the first few chapters of 'Varjak Paw')! I hope you enjoy reading the rest of Varjak Paw! I really enjoyed your books about Varjak Paw! They were (and still are) my favourite stories about cats. I first read them in Russian, my native language, about seven years ago, but now I want to re-buy them in English to see if there is any differences in translations. Also, I was surprised to know that you wrote a new book! I will definitely read it. I think it's pretty cool that I can write to the author of one of my favourite books like that! Also, I'm sorry if I made some mistakes, sometimes it's hard to express my thoughts in a different language. Hello, and thank you so much for your kind comment! It's great for me to hear from readers around the world, so I really appreciate your taking the time to leave me a message here. I hope you will enjoy reading Varjak Paw in English - and I hope you enjoy Phoenix too! Hello from Finland! Varjak Paw was my favorite book when I was younger(I still do love it!) and I'm definitely going to read you newest book soon! 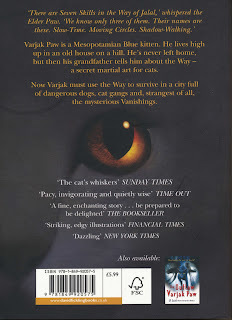 Varjak Paw was one of those books I can ''blame'' for my love towards literature and reading. Hello! Thank you so much for your kind comment - that really means a lot! I'm planning to do a blog post soon on the Finnish edition; I think it's called Varjak Käpälä? Hi Billy, and thank you for leaving me such a wonderful comment! I love the idea of a Varjak Paw club, that's amazing to hear – thank you so much for spreading the word to everyone in your class! Hello, I am tyresse, my class, onyx class, have been reading varjak paw. You may know my teacher, mr hall, read it to us, I was very interested in varjak paw. It's kind if sad the way that Julius bullied varjak. My favourite character in the story is Jalal and Varjak. My favourite part is when jalal fought varjak the way. I love your story I think it is amazing. I rate it I big massive 10 out of 10. Thank you so much for your comment! I really appreciate your 10 out of 10 – that means a lot to me. Varjak Paw took me five years to write, but when I hear reactions like that, it makes all the hard work feel worthwhile. Please say hello to Mr Hall and everyone in Onyx class for me – and keep the Way alive! Thanks for writing again! I'm interested to hear that your cat is called Lucky – because that's the name of the main character in my new book Phoenix! Please give my best wishes to your wife, and to your children! That book was the bomb! I enjoyed ever part of it. I know this is comin late. But this is my best book ever(in the whole world). This book really opened my imagination. I read it when i was in Grade 8. It was awesome. But too sad it wasnt my own copy. I really love this book. Really the best..more interesting than Stephen King's Dark half. Am now a university student..but i just cant forget "moving circles". My sincere regards 2 your family. Thank you so much for your wonderful comment! It's amazing for me to hear that Varjak Paw is your favourite book, even now that you're in university. And it's a great honour to be compared to Stephen King. As far as getting my books, it depends on what part of the world you live in. They're all currently in print in the UK, and I've put links to places where you can buy them on each page. If you're in the US, I think only Varjak Paw and Outlaw are in print, but you should be able to order them from your local bookstore... Good luck! Thank you again, and keep the Way alive! :) hello mr. SF Said. is there a movie coming out? Hi Prabhjot, and thank you for your message! I'm glad to hear you've now read both Varjak Paw books and enjoyed them. There will be a third Varjak book one day, but not for a while yet – I wrote a bit about my idea for it here. In the meantime, I hope you'll try my new book Phoenix – it's not about Varjak Paw, but I think if you enjoyed Varjak, you might enjoy it too. There isn't a movie planned at the moment, but hopefully one day! I wrote a bit about that question here. PS Thank you for your picture! Thank you so much for your comment! I love Cludge too, so I'm glad you do. But I love all the characters... As far as the film goes, there's nothing happening at the moment, but hopefully one day – you can read a bit about it here. SF Said, I litterly think every night about the third varjak book.. wait..THIIIIRDDD????? anyway, when will that come, any release dates? lol, you sorta spoiled it, i didnt have a chance to read it yet, im trying to get it. Thank you so much for your kind comment! I don't know when I will write the third Varjak book, but it won't be in the very near future. I wrote a bit about the reasons why, and about what the third book will be about, here. In the meantime, I hope you'll give my new book Phoenix a go: it's now available in paperback! And thank you so much about Tyger – I hope I finish it SOON too!!! That was a bit of a spoiler, wasn't it? Sorry! I've edited my answer... I hope you enjoy reading Phoenix anyway! P.S: I know it says anomynous, I'm a bit too lazy to make my own account, lol. Thank you so much for that fantastic comment - you've just made my day! We have been basing our literacy work around Varjak Paw and have just finished reading the book - the children loved it and were desperate for me to continue reding to find out what happened - the cliffhanger endings to chapters drove them mad! They wondered if you would have time to answer some questions for them... or visit the school to answer them in person? We are a very small school in Lancashire with only 22 pupils! 1. What was your favourite book when you were little? 2. What books did you read when you were a teenager? 3. What made you want to become a story-writer? 4. How long did it take you to write Varjak Paw? 5. Why is your book about cats? 6. Where did you get the inspiration for Varjak Paw? 7. Did you enjoy writing the story? 8. Did you have any help writing your books? 9. Do you read lots of book? 10. How old were you when you wrote your first book? 11. What is your favourite book that you have written? Why? What was your favourite book when you were little? Watership Down, by Richard Adams. You can read more about it here. What made you want to become a story-writer? All the stories that I loved myself. Books have always been there for me, and I really wanted to write stories that would be there for other people one day, too. How long did it take you to write Varjak Paw? Five years. That's a long time, but I think the end result was worth all the hard work – I hope you do too! Where did you get the inspiration for Varjak Paw? I was watching my own cat's adventures as he went out into the world for the first time, and found them incredibly dramatic and exciting. Quite a few things in Varjak Paw came from just watching my own cat. Do you read lots of books? Yes, all the writers I know read a lot. A writer is really just a reader who goes one step further, and writes the story they want to read. What is your favourite book that you have written? Why? My favourite so far is my new book Phoenix. I think each time I've written a book, I've learned something from it and improved a little as a writer, so my ambition is to make each book better than the last! Please give my best wishes to your class, and tell them to keep the Way alive! My name is Michael and I am in third grade. I read Varjak Paw because I’m in a reading group. I loved the part when they found Tam because I was surprised! Why did Julius become the leader? My name is Arianna and I’m in third grade. I read Varjak Paw because I was in a reading group. The book was really interesting and funny and sad and you did a great job on the book. My favorite part was when Varjak met Tam and Holly. Why did you write the book? And are there more skills? My name is Emily, and I am in third grade. The reason I read Varjak Paw is because I’m in a reading group that’s reading it. I love the part when Julius and Varjak fought because it was really exciting! How did Jalal learn the way? My name is Gabby and I am 8 years old. I read Varjak Paw because my reading group was reading it. I love the ending when Cludge jumps through the window because of the man's face. How did Sally Bones know the way? What does SF stand for in your name? Why did you write Varjak Paw? Is there going to be a third book? Will there be a movie or more than one movie? My name is Ashton and I loved the book Vajak Paw. Why I read the book is because I’m in a reading group. How did Varjak shadow walk? No cat can do that . When Varjak Paw shadow walks, it was amazing. Thank you so much for your kind words! I'm really glad you enjoyed Varjak Paw. I do think cats can be incredibly stealthy when they move, and sometimes it almost seems to me like they do merge with the shadows... so that's where the idea of Shadow-Walking began. I'm glad you liked it! How did Jalal learn the way? How did Sally Bones know the way? I think these questions will be answered in the third Varjak Paw book. I haven't written that one yet, but will do, one day. I wrote a bit about my idea for it here. Will there be a movie? I hope there will be, one day. If you want to know more about the Varjak Paw movie, I wrote about it here. Why did you write the book? I wrote it because it captured and expressed everything I cared about at the time when I was writing it. I think books should do that; they should contain everything an author loves most. My new book Phoenix does this too, even though it's about humans and aliens, rather than cats and dogs! My name is Ellora and I am in 3rd grade. I like how the detail and the adventure parts of Varjak Paw. I want to know what got you to think up the story of Varjak Paw. My name is Demi and you came to my school foxfield to talk about your books.I love all of them even though I have just seen the front cover of them.I love your book varjak paw but I have not read all of it.So I am going to buy it to read it all and I might even buy the outlaw of varjak paw.so that leaves me with one question.What inspirerd you to write phoenix? I would love for a third, closing-on-Varjak's-story book! I know it's been around two years and I'm not sure if people still check this place, but even a little one-chapter epilouge of the character's lives would be nice to consider. Of course, most would assume that things would melt into peace for the city, the Free Cats (especially for Little Jess, seeing her flourish and reflect on Mrs Mogg's death, if she's changed, ect/Varjak and Holly, Ozzie[? I think he's the one, right?] and Tam being in love, maybe starting families/how Varjak's gang flourishes, how Razor and the two Siamese Sisters are coping, ect. Just some ideas to throw out there (unless you've thought of them already of course.) But if you're done with the series (I can understand if you feel like you've "grown out" of it, although it's one of those more simpler books that actually give good meaning and mindblowing moral/results to everything - a classic and blended with cultures, I wonder if more people have read it til now) and want to leave things to imagination, then that's perfectly great as well. Also, as for the cultures - I figure they're a blend of Far East/Southern East (the fighting styles) and Egyptian (I think Mesopotamia was originally settled near Egypt/the "sphynx" drawings in the second book) cultures? Also, when I improve some more on my drawing, I'd love to do some "fan art" on the main trio, including Cludge <3 Anatomy all over for any creature is always a little complicated, though McKean's inky style has always inspired me, so I might go with drawing on paper or digital! Hm. Thank you so much for your kind comment - it was a pleasure to visit Foxfield and to meet everyone. Phoenix has many inspirations. Perhaps the biggest one of all is the stars themselves. I've written a little bit about this inspiration in this blog post. I hope you enjoy it, and I hope you enjoy reading my books! Hello! It was great to visit Foxfield, I really enjoyed meeting everyone! Thank you so much for your kind comment! I really enjoyed visiting Foxfield and meeting everyone; it was a pleasure to sign books for you. Happy reading! Thanks again for all your thoughts! It's amazing to hear that the Varjak Paw books still mean so much to you; there are books I read as a kid that I still re-read, but not many, so I know how rare that is. As I mentioned in the reply to your posts on the Outlaw page, most of what I know about the third book I've already said on this blog; and the truth is, I'll only really know what I'm going to do when I'm doing it, as my books always change a lot during the writing! But I'll certainly post about any new developments here as & when they happen. In the meantime, I hope you enjoy Phoenix too - no cats or dogs, but it comes from a very similar place... and I think it's the best book I've written so far! I am Foyinsola and I really enjoyed you coming to my school on the 30th of January. You came to Foxfield Primary School and you said you were ten when you had the idea of writing Varjak Paw -is it really true you. P.S. my friend Demi commented on this. Bye!! Thank you so much for your lovely comment! That's very kind indeed. Thank you so much for your kind comment! I really enjoyed visiting Foxfield and meeting everyone. I didn't have the idea of writing Varjak Paw when I was ten. The idea for that particular book began when I was watching my own cat's adventures, when I was about thirty! But I remember at ten, I definitely had the idea that I wanted to write books one day, and I was already writing lots of short stories. So I think that proves you can write at any age. I'm still the same person now who wanted to write books when I was ten, so in a way, all my writing goes back to that! My class and I have been reading Varjak Paw and are nearly at the end. We are really enjoying it I can't wait to read your other book Pheonix next. Thank you so much for your kind comment – I really appreciate it! Varjak Paw took me 5 years to write, which is a long time. But I wanted it to be as good as I could possibly make it, and I feel it was worth all the hard work in the end. I hope you enjoy the rest of the book, and I hope you enjoy Phoenix too; that one took 7 years! My class is reading Varjak Paw im loving it its AWESOME we are near the end and we are going to read "The outlaw of Varjak Paw " I cant wait to read it. I have two questions.1 Do you have cats and what are their names?2 which is your favourite character? 2. I like all the characters; it's impossible for me to choose a favourite! But I'd be interested to know who your favourite character is? Thank you so much for that amazing comment. It really means a lot to hear that reading Varjak Paw is one of your best memories from when you were younger. I have a few books I feel that way about, so it's amazing to think that someone feels that way about Varjak! Here's a blog I wrote about one of my favourite books. I hope you enjoy The Outlaw Varjak Paw too – please let me know how it goes! I think ten or four because your a AMAZING writer and my favourt writer so thanks if you reply. Thank you so much for that lovely comment! I'm glad you like those characters, especially Cludge - I like them too. I started writing Varjak Paw in 1997, and it was published in 2003. It took me 5 years to write. I started writing The Outlaw Varjak Paw around 2002, and it was published in 2005. So that one took 3 years. And Phoenix, my new book, started in 2006, but wasn't published until 2013, so that one took 7 years. So as you can see, it takes me a long time to write each book - but it's TOTALLY WORTH IT when I get a FANTASTIC comment like that! That's great to hear! I hope your brother enjoyed Phoenix, and I hope you do too. Please let me know how it goes if you have a chance to read it. I've read both of your Varjak Paw books and I really, really liked them. I find them really imaginative. I was wondering if you could write a third Varjak story please? I am nine years old and I was wondering if you think I would like Phoenix? I've seen it in the school library and it's very thick. Thank you so much for your fantastic message – it's great to hear from a reader in Kuala Lumpur! I will definitely write a third Varjak story one day – I wrote a bit about my idea for it here. In the meantime, if you like Varjak Paw and you're nine years old, I think there's a very good chance that you'll like Phoenix too. It's not about cats and dogs, it's humans and aliens this time, but it comes from a similar place. And it might look very thick, but there are a lot of illustrations, and I've heard that some nine year olds read it in only a few days! Please let me know what you think if you do decide to read it. I first read Varjak Paw when I was in primary school, it was the book that brought me into the world of reading. I especially liked the concept of the seven skills, and I have a couple of questions about them; Are they a martial arts form, or do they use magic, or both? for example dose Slow-time actually slow down time or is it just in the mind of the user. Also, what exactly is moving circles? When you wright about it it's beautiful but a little confusing. Thank you! Can't wait for the 3rd book! Thank you very much for your comment! I'm glad you enjoyed Varjak Paw, and it's amazing to hear it was the book that got you into reading. For me, the Seven Skills are definitely a martial art. But I think martial arts can produce results that look magical. So much of our experience is subjective, and if you can control something like time in your own mind, perhaps that can have effects in the real world too. As far as moving circles go, I was thinking about martial arts like Aikido and Tai Chi, which use circular movements, as well as the way that cats actually move. If you enjoyed the martial arts in Varjak Paw, I'd definitely recommend reading my new book Phoenix - there's a system of martial arts there that's based on the stars and constellations! MAKE A MOVIE ITS SOO GOOD!!! Thank you so much! I would love to see a movie of Varjak Paw, and I'm still hoping it will get made one day. In the meantime, there's some info about it here! But with Varjak Paw, I was watching my own cat's adventures as he went out into the world on his own, and thought they'd make a good story. I hope you enjoyed it! Thank you for your comment! I thought it was absolutely amazing - I made a blog post about it here. Were you part of it? Which character did you play if so?! It's been about 6 years since I read Varjak Paw and it's sequel. I stumbled upon the front cover on the internet the other day and all these memories came rushing back to me; the nail biting fights described to perfection; the constant cliff hangers which would keep me up way beyond my bedtime; the ingenious characters which inspired me so much! Despite your books being considered children's books I am definitely going to read them all over again (..soon to leave home for college!). Your books have played a huge part in my childhood and it's great to see so many other children as intrigued and as inquisitive as I was: 12 years on! One question if you don't mind... Does 'Varjak' have a meaning or translation- what's the reason you chose this name? So I would be very interested to hear how Varjak seems to you now you're going to college – and what you think of Phoenix! To answer your question, I named the character of Varjak after my own cat, who inspired the story, and was called Varjak Paw! Thank you so much for your comment! I really enjoyed visiting Beecholme and meeting you all. Please give my best wishes to everyone! I like your idea for another Phoenix book. I don't think that I will write that story myself, as I'm deep in writing my new book Tyger at the moment – but I think it would be amazing if you wrote that story! I love it when readers write stories using my characters and worlds, and I would be totally honoured if you ever wanted to do that. I stumbled across Varjak Paw in my local library a few days ago. I love the 2 books and I have some ideas about the third. I suggest reading Warrior Cats (by Erin Hunter) and I was discussing with my mom about why there wasn't a third book yet. She answered 'write it yourself'. I am halfway through it but it links with warrior cats as well. Yes, I am going to high school next year, a grammar school in fact, but I adore fantasy books and animal books. My job is to keep the way alive and it is hard, seeing as I am nearly 12, and no one likes what I like. Read warriors and you'll be inspired. Also, do you have Instagram. After you've read warriors, search ZephyrClan and SunClan. I was part of SunClan myself, until homework rudely interrupted. It is brilliant what fans can do. Thank you so much for your fantastic comment! It means a lot to hear things like that about my books. There will be a third Varjak Paw book one day; I wrote a bit about my idea for it here. In the meantime, I think your mom gave you great advice. Some of the first stories I ever wrote were based on other people's stories, and I'm honoured that you're writing a Varjak Paw story! I don't have Instagram, but I am on Twitter as @whatSFSaid. I know it is hard not knowing anyone who like the same things you like. But there are definitely other people out there who do – just see all the other comments on this page if you don't believe me! Thank you so much for your comment! That's interesting and exciting to hear. I'm afraid I can't add anything to what's already in the two Varjak Paw books; everything I know about the Way is there! So if you haven't already read The Outlaw Varjak Paw, I'd recommend reading that. However, I do know that quite a few teachers have done things similar to what you're describing, so it can definitely work! Thank you for your wonderful message, and your questions. I hope you enjoy The Outlaw Varjak Paw too, please let me know what you think if you do read it! I wrote a bit about your first question here. And SF stands for Sabah Falah - they're my initials. They're Arabic names, so they're difficult to pronounce if you don't speak Arabic, which is why I started using initials. Hi there, thank you for your comment. There isn't a Varjak Paw movie yet, but I hope there will be one day! I wrote a bit about the story so far in this blog post. Thank you so much for you brilliant comment! I'm really glad that you're enjoying Varjak Paw, and I hope Santa brings you a copy for Christmas! Who is your favourite character so far? Please give my best wishes to everyone at your school, including your teacher, and tell them to keep the Way alive! Thank you so much - that really means a lot to me! Have you had a chance to read the sequel, The Outlaw Varjak Paw? I love your Varjak paw books. 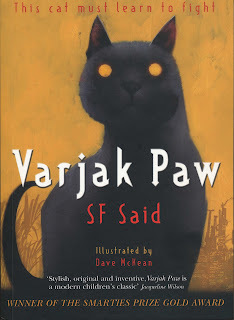 My favourite book is The Out Law Varjak Paw because when Varjak loses his powers and led his friends to safety. My favourite characters are Jess, Holly, Varjak, Tam and The Scratch Sisters. I think you could make a third Varjak paw book . With a new enemy and all the rest of Sally Bones gang could join Varjaks side . And Sally Bones could have a long lost sister who comes and try's to kill Varjak. She could have new punishments. Maybe Varjak and Holly could get married and have kittens. Or maybe Sally Bones comes back to life . And Jilal could teach Varjak some new moves. Or Sally Bones put the Ice blue eye in Holly so she can take over. Possibly Holly could be related to Sally Bones. Thank you so much for your fantastic comment! I really appreciate it, and I'm really glad you enjoyed my books. I am definitely going to write a third Varjak Paw book one day; I wrote a bit about my idea for it in this blog post. In the meantime, have you had a chance to read my new book Phoenix yet? It's not about Varjak Paw, but I hope that if you enjoyed Varjak, you will enjoy it too! That's amazing to hear – thank you so much! I love their books too, especially Harry Potter. I hope you enjoy Phoenix; please let me know what you think when you've had a chance to read it. And HAPPY BIRTHDAY for seven days' time! We are writing to you from a Year 4 classroom in Blackhorse Primary School, Emersons Green, South Gloucestershire. • What happened to the Contessa? • Where is Elder Paw’s body or was he turned into a toy cat? • How did the Gentleman turn the cats into toy cats? Thank you for taking the time to read our questions, we look forward to hearing from you soon. In the meantime, we will begin to read your sequel- The Outlaw Varjak Paw! Thank you so much for your lovely comment! I'm really glad you enjoyed Varjak Paw, and I hope you enjoy The Outlaw Varjak Paw as well. It was very important to me while writing Varjak Paw that everything in the book should be seen from Varjak's point of view. We never leave his point of view for a moment, even when he's asleep. This means that we can never know more than Varjak does. If there's something in the book that he doesn't know, then it's up to us as readers to use our imaginations and decide for ourselves what the answers are. And I think each individual reader is entitled to reach their own answers. That's a wonderful thing about books – that we each have the space and the freedom to do that. Where something is not answered in a book, then every reader's answer is as valid is the writer's. So I think all three of your questions are excellent questions, because they show you've noticed things that Varjak doesn't know. The answers aren't in the book, because Varjak doesn't know them. So I would ask you all to use your imaginations when thinking about these questions, and whatever your answers are, I think they are as valid as mine! Thank you so much for your fantastic comment – and please don't worry about the spelling mistakes, it always means a lot to hear from readers, and I know it can be difficult sometimes! It's great to hear that you enjoyed reading Varjak Paw, and that you're now enjoying The Outlaw Varjak Paw as well. Please let me know what you think when you get to the end! Hello. I've read Varjak Paw with my daughter, and we're trying to find an audio recording of the story. I know that The Outlaw Varjak Paw is availble on Audible, but I am having difficulty finding an audio version of the first book in the series. Is there one that I've just missed? Oh! Mr. Said, please ignore my earlier note. I've found a cd recording of Varjak Paw. I'm hoping that you will be able to offer it on Audible or even as a cd again...it looks like the only ones on offer at Amazon are either used or priced in the thousands of dollars. At any rate, thanks again for writing such a top notch story. my name is Nabeeha and i really loved Varjak Paw. hopefully you will read this and reply to me. Thank you so much for your lovely comment! I'm really glad you enjoyed Varjak Paw. Have you had a chance to read the sequel yet – The Outlaw Varjak Paw? Thank you very much for your comments! I'm so glad that you and your daughter enjoyed Varjak Paw. I think it should be available on Audible at the moment, but if you can let me know where in the world you're based (I'm guessing the US or Canada? ), I can ask my publishers what the situation is in that country, and get back to you with any information they might have. I feel like this is far too long overdue but I wanted to thank you for writing the absolutely fantastic books that are Varjak Paw and The Outlaw Varjak Paw. It's been roughly eleven years since I first had the pleasure of reading those books and have reread them many times since and they never cease to delight me each time I do. When I first read Varjak Paw at around the age of seven I was not a fan of reading, to put it lightly, as I found it an extremely tedious pastime as a child but reading Varjak's story changed that. I honestly can't even imagine not having loved reading anymore because of the amount of sheer joy it brings me now. Books and the stories they contain are such amazing things that without them I'd be at a loss. So thank you so much for sparking that love of reading in me with your fantastic books. Thank you so much for your amazing message! It's incredible to me to think that a book I wrote became the means by which someone else discovered the joy of books and reading - you can't imagine how much that means to me. You also can't imagine how much it means to hear that you still enjoy my books eleven years later! I always hope that adults will enjoy them too, and that they might be the kinds of books that people continue to read through their lives, in the way I did with a few favourite childhood books, such as Watership Down. Also, if you're interested in general book talk, I do a lot of it on Twitter these days, where I'm @whatSFSaid. Thank you so much again, and keep the Way alive! Thank you so much for your amazing comment! It means a lot to hear things like that about my books. I hope you enjoy Phoenix too - please let me know what you think when you've had a chance to read it! I really love your books and hope to read the third Varjak Paw and Phonix. My class is considering asking you to visit! The comment above is from my friend, Olivia. You may receive a lot of comments from my class! My name is Joe, I go to Whaplode CofE Primary school. I loved Varjak Paw and The Outlaw Varjak Paw. My Teacher Mrs Adie has just ordered Phoenix because we saw the AMAZING!!! clip. We are hoping you could come to my school in Whaplode to tell us a little bit more about you and your books. I would love to meet so please please read this. If you could please just pop into Whaplode school to give me and my classmates a little hint about some of your newest books like Phoenix.������!!!! You are my favorite author and I do hope you do wright a third varjak paw you are AWESOME!!!! Hi Rohan, thank you for your fantastic message, and please thank Mrs Adie for me too! I hope you enjoy Phoenix - I think it's my best book yet! Thank you so much - it's great to hear from you and everyone in your class! If your school would like to invite me to visit, please could you ask a teacher to leave me a message on my Author Visits page, so we can discuss the details? Thank you so much, that means a lot! I will write a third Varjak Paw book one day - you can read a bit about it in this blog post. Thank you so much for your fantastic comment! Varjak Paw took me a long time to write, but all the hard work feels worthwhile when I hear things like that from readers! If your school would like to invite me to visit, please could you ask a teacher to leave me a message on my Author Visits page, so we can discuss the details? Thankyou I love how you make the books so interesting. I will keep the way alive!!! all my other class mates the put comments. The first and second varjak paw books were amazing! And we you're going to write a third varjak paw book which is great! And we can't wait for Phoenix! Your books are incredibe our teacher Mrs Adie and all my class love your book . what is it like being an author? Hi it Olivia again, my class has been bugging u with comments I am so sorry. I heard that u would love to visit our school. Our teacher Mrs Adie told us yesterday. We r soooooo excited I can not wait!!!!!!! 😎😎😎😎😜😜😜😝😝😝😝😝 Thank you for replying to all of our comments. U r sooooo AMAZING!!!!! Me and my class r soooooo EXCITED!!!!!! We love u. Thanks for your message! Yes, I'm talking to Mrs Adie about coming to visit your school - hopefully we'll work out the details soon. Happy reading in the meantime! And keep the Way alive too! Thank you so much! I think being an author is hard work - I don't find writing easy. But it's always worthwhile in the end, to see the finished book! Thank you so much! I hope you enjoy Phoenix too - here's a link to Dave McKean's amazing book trailer for it! Hi This is my daughters poem that was too long to tweet! What a fantastic poem! I love it - please thank her from me for writing it, and tell her to keep the Way alive! Thank you so much for your fantastic comment! There will be a third Varjak Paw book one day – I wrote a bit about my idea for it in this blog post. In the meantime, have you read my new book Phoenix yet? It's not about Varjak Paw, but I think it might be my best book yet! I hope there will be a Varjak Paw movie one day too; I wrote about it in this blog post. Finally, I am always interested in visiting schools and meeting readers. Could you ask a teacher from your school to get in touch if they would like to invite me to visit, by leaving me a message on my Author Visits page? Maybe for the third book you could put the rest of Sally Bones gang and they decide to seek revenge. Thank you for the suggestion, Elder Paw! And I like your name! When are you doing a third book of varjak paw because both books are amazing. I even read the outlaw varjak paw 20 times I liked it that much. My name is Maddie Paige and I'm going into my final year of college before (hopefully) attending university next year. Currently, I'm starting my EPQ (extended project qualification) which is an additional subject in which you research something which interests you and present your project at the end of the year. I have chosen to base my EPQ on the importance but also the change in children's literature throughout time, and I wondered if it would be at all possible if you could answer a few questions which would help my project immensely. If you could spare a moment to have a read and possibly answer whichever you can I would be incredibly grateful as to be able to quote from such a talented writer would benefit my work immensely. 1) How heavily did the books you read as a child impact your work and life as a whole? 2) Have you seen a change in children's literature throughout your lifetime? If so, in what ways? 3) How important do you feel children's literature is to society? 4) Do you think the more contemporary topics used in children's literature nowadays e.g broken homes, sexual identity is due to society changing into a more open, accepting place or is it the literature that has changed society? Any contribution would be greatly appreciated, however I understand you must be immensely busy and so I thank you for your time and wish you all the best for your future works- I hope being are still enjoying your work as much as I did. Thank you so much, Elder Paw – that's amazing to hear. And as it happens, I've just written a piece all about my idea for the third Varjak Paw book. Here's a link to the piece – I hope it answers your question. Thank you very much for your message. Those are some interesting questions! Do you have an email address I can reply to? How have you been? Re-reading the duology and it's bringing back memories. I can understand why people want a third and final book, but I can also understand how it can be difficult to come up with another book - you would have to think of a new villian/plot altogether, and new chapters in the lives of the characters you've made. You could probably do something about Julius... but then that would probably add on a few more books. My class read Varjak Paw and we were instantly obsessed! I loved it so much that I've decided to put on a show at my school. Since I live a long way away from you (probably, I live in the middle of nowhere) you probably will never see it, but I just want you to know that we appreciate your work. Thank you for all you've done for me and my class. We have had a whole new world opened to us when we read your books. Thank you so much for your amazing message! It's incredible to hear that your class loved Varjak Paw so much, you're putting on a show of it. That really means a huge amount to me. Whereabouts is your school, just out of interest? There have been a few shows of Varjak Paw done by schools in the past - if you like, you can read more about them here! NEW! Join the email list for regular news from SF Said!